Algonquin senior middie Mike Martens celebrates his game-winning goal. Just moments after allowing Acton-Boxborough to force overtime with a regulation buzzer-beater, Algonquin scored its biggest win of the season, courtesy of a game-winner from senior captain Mike Martens. Ed. Note- Complete highlights of this overtime thriller are now up on ESPN Boston, but we have provided highlights of A-B's buzzer-beater and Algonquin's overtime game-winner below. First-year Algonquin coach Matt Nofsinger essentially gave his senior All-American the green light to go for the score, and when the Colonials came late with the double-team, Martens made them pay with a bottom-shelf goal. The 8-7 overtime victory pushed Algonquin to 4-0, and dropped the Colonials, who have played a murderous early schedule, to 2-4. "I told the kids to forget about the mystique (of A-B), to forget about what division they're in, and forget about the fact that we haven't beaten them. All that matters are the 48 minutes that we've been given," Nofsinger said. "That's obviously a top-notch program. They're well coached, and they've got great kids going on to play for good schools, but I'll take my group and put them up against anybody, anytime. 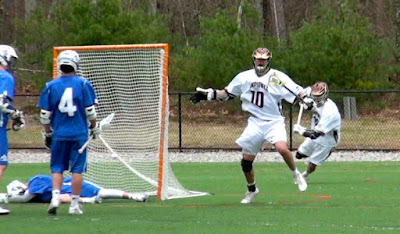 Acton-Boxborough Buzzer-Beat & Algonquin Game-Winner from Joe Parello on Vimeo. The Tomahawks jumped out to an early 4-0 lead, courtesy of a pair of assists from junior attackman Zack Skowronek, and goals from Martens, sophomore Tommy Ackil, junior Drew Cammarano and senior Matt McEvoy, but A-B did get plenty of chances. Luckily for Algonquin, senior goalie Colton King came to play, turning away nine shots in the first half to give the Tomahawks a 4-2 halftime lead. King would finish the game with 15 saves, including a critical stop in overtime to set up Martens' game-winner. In fact, one of A-B's goals came with King in the box for a slash, meaning he only surrendered six goals while facing 21 shots on net against one of the state's most explosive offenses. "As a goalie, if you let in a goal, you want it to be out of your head like that," King said. "But once you have a couple of saves under your belt, it kind of boosts your confidence. Once you have your confidence up, you start seeing the ball well, and it's kind of like a snowball (effect)." While it was a great win for Algonquin, it wasn't perfect, and nothing came easy. Blaine Carroll sniped a goal in to pull Acton-Boxborough within one with just two minutes to play, and Algonquin possessed the ball inside of 10 seconds remaining while holding a one-goal lead. Unfortunately for the T-Hawks, an errant pass was swiped and pushed downfield. There, A-B's Pierce Capachione grabbed the bouncing ball, and dashed forward to throw in the tying goal with one second left on the clock. It took the wind out of Algonquin's sails and caused an eruption on the Colonial sideline. Clearly, A-B had momentum on its side heading into the extra period, but Martens won the opening face-off of OT and, even though the T-Hawks didn't cash in, King made a big save to give his team the ball right back. Once he did, Martens didn't hesitate to force the issue. The Tomahawks called timeout and gave him the ball. "It was just a sweep around the top, and I think I was supposed to bang it around to X if I didn't get a shot off the initial dodge, but I was getting that shot off," Martens said with a laugh. "It was either gonna be a turnover or a shot." Algonquin is off to a great start this week, but it hardly has time to rest. The Tomahawks will host a strong Hopkinton team Thursday, then Western Mass power Minnechaug Saturday. That Saturday game could end up being a Division 2 Central/West playoff preview, as the Falcons are off to a hot start. If Algonquin can emerge from this week unscathed, it will be hard not to think of the T-Hawks as a district favorite the rest of the year. Hey Joe - great video clip. That must of have been a fun one to watch. AB tying it up with 6 seconds, then Gonk winning in OT! Congrats to Coach Nof and his team. Yep, was a heck of a game, and a big win for the T-Hawks. Grafton-Cohasset should be another good one this Thursday at Weston High. Maybe I'll see ya there!